While we don’t have the specifications available for what powers Santa’s sleigh, we know it must be a pretty powerful unit to get him around the world on a single night. The big question we have here is how it might compare to the new Hyundai i40. It can get cold at this time of year, and while Santa has to make do with a warm pair of gloves, i40 owners have a heated steering wheel at their disposal. It’s also a pretty fair bet that the bi-xenon headlights are a little brighter than the light being delivered by Rudolph’s nose. The new Hyundai i40 comes with a 5-year unlimited warranty, and we can pretty much guarantee that the technicians working on it might be a little more skilled than Santa’s elves. Sending a letter to Santa takes some time, but you can live message him from your i40 using Android Auto. 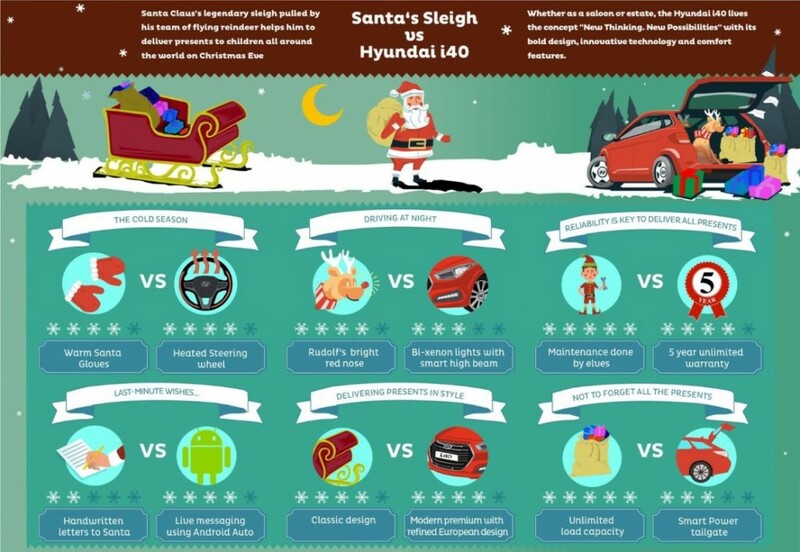 The sleigh that Santa drives has a classic design that hasn’t changed in years, whereas the i40 has a new European-inspired design. The i40 also has plenty of cargo space, although perhaps not as much as the sleigh. As much as we all love the sleigh that Santa drives, I think we prefer the i40 as an everyday ride.